And in what always seems like the blink of an eye, we’ve officially moved into July (ooh hey, that rhymes). In some ways it seems like a lot has happened and in others, like nothing has changed. As I type this now, I’m at my grandparents’ house. We come to visit this time every year for my grandfather’s birthday and this year he is turning 92. They are currently sitting across from each other at the table, immersed in battle playing the harrowing game of Russian Bank. The windows are open in the living room, birds are chirping away happily in their trees and occasionally we hear the sound of a car driving by from a distance. It should come as no surprise that they are the King and Queen of enjoying the slow life and quiet moments. I have a lot to learn from them and undoubtedly a lot I never will learn but I figure at very least I can relax in these moments and visit whenever we are able (which is usually only Thanksgiving, Christmas and July 4th weekend). Last month I feel like I made progress in enjoying more “quiet moments” however I also fell victim to still wasting more time than necessary –hello Facebook– on unimportant things. My focus then, for this month, is to continue working on my priorities and essentially things that allow me to get there in the short and long run. 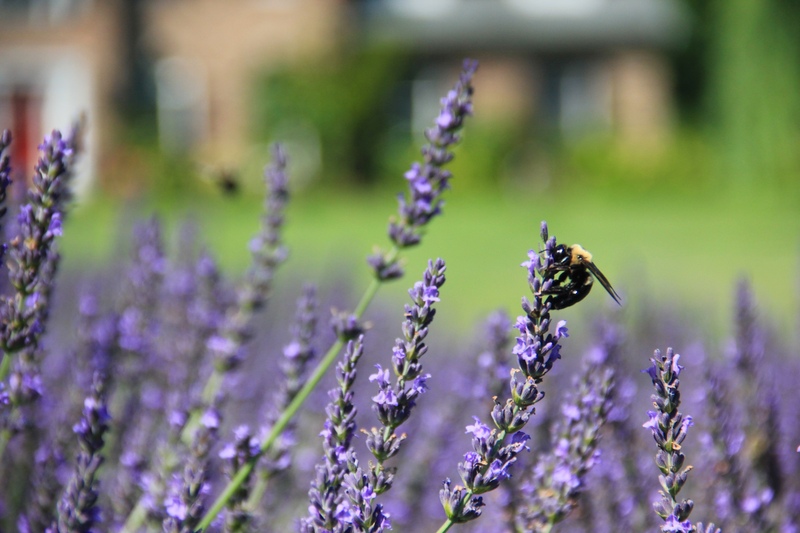 Happy bees from when I went lavender harvesting. Here is a recap of last month and the plan for this month! 1. Write introduction and ingredients page for book proposal: I made some progress on this but ultimately didn’t finish it. And if were are being completely honest, I had a few nights where I really got a lot done in those evenings and then didn’t work on it for a good while. 2. Read 4 books: I read 3 books this month rather than 4 however it’s more than I would have otherwise so I’m pleased about it. I really enjoyed reading the Miss Peregrine’s Home for Peculiar Children (Miss Peregrine’s Peculiar Children) trilogy! 3. Finish “komono” items: This was an exciting success! While I had more difficulty officially sorting things to then go through them in a more organized manner (I really ended up just opening boxes and going through them that way) I feel that I’ve finally hit that “sweet spot” of being comfortable with the items I have kept. I suspect I’ll reassess things differently once Mr. C and I move into our own place and I can take everything out of boxes, but for now I feel comfortable with what I have chosen to keep. I’ve been realizing that I’ve taken a calm sort of happiness having many more things that officially have “a spot” or a home- a place to go rather than traveling aimlessly around the house. 4. Resume workout schedule: This definitely got much more on track and while my weight lifting took a bit of a back seat to Spinning classes this month, I’m excited to announce that I finished my Spinning Certification and have now been signed up as a substitute instructor at my local gym! I have taught two classes so far. 5. Post 2X/ Weekly: Admittedly, my “weeks” were a little disorganized however overall I can say that I posted much more often than I have in previous months and had 7 posts total for the month. I’d really like to focus on more consistency however. 1. Post Consistently This Month: As previously stated, I’d like to post twice a week but at a more consistent schedule within the week. 2. #LoveMySizeLoveMyLife: I’ve been much more active recently in terms of actually getting out and doing things. I’ve still been going to the gym and enjoying myself there but I’m excited to be focusing on doing things just for the sake of enjoying myself and being outdoors. Late last month I campaigned to defend fat and specifically discussing the importance of body fat. I plan to continue to explore and develop this idea. 3. Research Graduate Schools: In all my focus on “today” and “now” I’ve fallen behind on my graduate school research. I’d like to really make a focus on researching and really narrowing down my options. I’ve had two schools specifically in my sights for a while but I want to make sure there’s no where else I’m missing out on. 4. Continue Progress on Book Proposal: Continuing from last month I’d like to keep working on fleshing out the skeletal structure of the book. Is there anything that you are working on this month? What are your goals and focus?